If he was nervous about playing in his first regular season NHL game with the Ottawa Senators, the 29-year-old Brassard did a masterful job masking it. Born in Hull, Quebec, about a 10-minute drive from Ottawa, the centreman was looking to make a good first impression in his Sens debut. Brassard, in 16:50 of ice time, netted an unassisted goal in the second period, assisted on Erik Karlsson’s first period tally and earned Third Star Honours in a 5-4 win over rival Toronto. Just the way he scripted it, right? Ottawa is hoping to see more of the same from the player they acquired in a trade with the New York Rangers this July. For his part, Brassard felt comfortable from the first time he took to the ice with his new teammates. 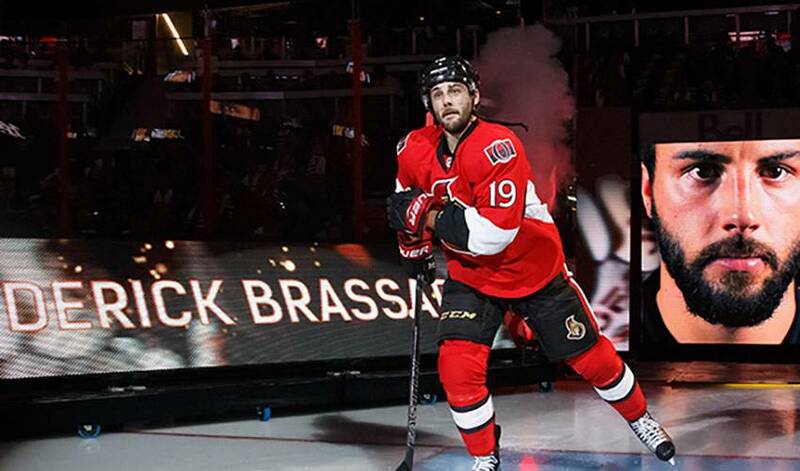 Brassard played with Cody Ceci and Mark Stone as members of gold medal-winning Team Canada at the 2016 World Championships, knew Mike Hoffman from their junior hockey days and was familiar with Jean-Gabriel Pageau from living in Hull. He also played one season, in 2006-07, under head coach Guy Bouchard when he held the same role with Drummondville of the Quebec Major Junior Hockey League. Now, Brassard, the sixth overall pick of Columbus in the 2006 NHL Entry Draft, will look to play his part in getting the Senators back in the playoff picture. Last season, Ottawa finished fifth in the Atlantic Division. If his first game is any indication of the support he’ll receive throughout the season, Brassard, who had a career-best 27 goals last season with the Rangers, can expect to hear plenty of cheers, especially when he turns in a performance like he did on October 12. After helping the Rangers advance to the second-round of the playoffs, Derick Brassard is our Player of the Week.